Elephants and Feng Shui Elephants are often used in Feng Shui to energize certain areas of the home and for good luck. The elephant is associated with Buddha and the Indian deity Ganesh and can be used to symbolize power, wisdom, strength, protection of the home, fertility, and general good luck. Work success Place an elephant near the front door or the door of the office to attract power and to protect the person from bad energy in the office. Many Feng Shui practitioners believe that elephants should have their trunks facing upwards to represent prosperity, good luck, and success. 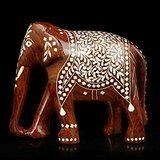 Elaphant Statue are made of wooden. Size : 6 Inches Height X 7 Inches wide X 3 Inches depth, Weight : 0.565 Kg, Material : - High Quality Kadam Wood, Features: - Made from Quality Wooden and Handmade in India.